"The childlike Mork is disappointed to find out that, on earth, eggs don't fly." Fools are utterly ignorant persons, who will take amazing risks simply because they don't know better. They don't know embarrassment, or fear. They laugh and sing and step off cliffs. The fool is the archetype at the very beginning of the Hero's Journey, a journey that ends when the Fool has become the Magician. At this point, the cycle begins again and we are once more a Fool, starting a brand new journey at a higher level. Mork graphic and quote swiped from The Ultimate Robin Williams. 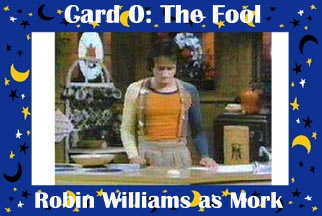 MIDI Theme from Mork and Mindy For alternate Fools, see the Magician.